If you are in higher ed using classic version of salesforce, this blog post would help you to leverage features which would make your life easy, prevent problems and provide more insights. On a side note, please plan to move to lightning next year as you would be losing a lot of features. In just a few clicks, you can deploy login pages that simplify how external users log in to your community. With the Login Discovery feature, you can let your external users identify themselves using something other than a username, such as a phone number. Instead of a password, they can verify their identity with a code sent to their email or mobile device. And, if your org is enabled with multiple Identity Providers (IdPs), login is a one-step process—users bypass verification altogether. How does this help you? This would be a great feature for international students community users who tend to access communities through the mobile device a lot. Create a public help center, and make it easy for everyone to discover your knowledge resources and find solutions for themselves. Instead of filing cases through customer service, customers can find what they need from the articles you make available from your knowledge base. Take the Knowledge articles that your support team already uses for solving customer problems, and share them directly with everyone. With your help center’s public access, customers don’t have to log in to find solutions. On the Home page, customers can jump right to featured topics or enter a search term. On the Customer Support page, customers can file a case or get on-the-spot access to articles related to their issue. How does this help you? If you have a lot of articles on faq on your student requests, you can directly convert this to a knowledge base and save a lot of time on support. When you talk to people, it’s rarely like a feed, where one person asks a question and everyone else answers. In real life, when one person asks a question, someone answers, and then there’s a reply to that answer and a reply to that reply. Now you can experience this lively flow in your communities with threaded discussions. A thread is any feed item that has one or more levels nested under it. For example, a question with an answer or a comment with a reply is a thread. A threaded discussion can have up to three levels of replies. Discussions are indented to make it clear who’s responding to what. This would help to increase engagement within your student communities. How does this help you? 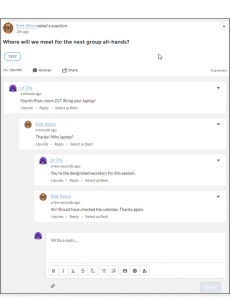 You can allow your students to respond to several threaded requests in one feed instead of jumping to different posts saving a lot of time in emails. Guest users can now access flows through your public community pages. 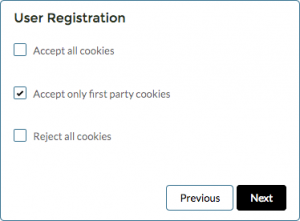 With flows, you can guide your users through the registration process while learning more about them, allowing you to provide the best community experience possible. How does this help you? If you have international students, you can have students follow through the registration pages with GDPR compliance forms automatically before they register on your community portal. Get and keep your members engaged by giving them recognition badges. We start you off with four: Congratulations, Welcome, Nice Work, and Thanks. You can also create your own with images and messaging. How: Enable Work.com’s Thanks feature. In Classic, from Setup enter Work.com in the Quick Find box, and then select Work.com Settings. How does this help you? You should leverage these badges to increase adoption within your student communities. Salesforce guarantees to retain your field history data for up to 18 months. To ensure high availability of data and accommodate the fast-growing data needs of our customers, up until now, we haven’t enforced the 18-month retention policy. Starting with Winter ’19, you can access data older than 18 months only in a limited fashion via the API. In Spring ’19, we start deleting the data. To retain field history longer, purchase the Field Audit Trail (FAT) add-on. When your marketing team connects their Pardot and Salesforce campaigns, they don’t have to think twice about which system to use to add campaign members. Members that are added to Salesforce campaigns show up on connected records in Pardot, and vice versa. How does this help you? For marketing departments running prospective student campaigns, you can effectively sync your campaigns in pardot and salesforce and track campaign ROI in Salesforce. you can view your content deliveries more times—formerly 20,000, now up to 50,000 times in a 24-hour period. We also raised the delivery bandwidth limit from 20 GB to 50 GB every 24 hours. How does this help you? If you are a continuing education user using salesforce, you can now send white papers in a content pack to your prospective students and track the downloads effectively. Use the new ProfileId and LogDate access metrics fields to prioritize which Visualforce pages to migrate to Lightning Experience. To decide which Visualforce pages to migrate to Lightning Experience, it’s helpful to know which pages are used most often and by whom. These new Visualforce Access Metrics fields show you that information. The ProfileId field shows the Salesforce profile ID of the user who viewed the Visualforce page. The LogDate field shows the date that the user accessed the page. This field provides more insight into page usage than the MetricsDate field, which represents the date the metrics are collected. This would help in deciding which pages to migrate to Lightning easily. Here is the soql query to get the visual force page metrics for your org. Apex Replay Debugger simulates a live debugging session using a debug log, which is a recording of all interactions in a transaction. You no longer need to parse through thousands of log lines manually. Instead, Apex Replay Debugger presents the logged information similarly to an interactive debugger, so you can debug your Apex code. With this release, we added checkpoints, which provide more information about your variables than debug logs do. Apex Replay Debugger is generally available when Salesforce Extensions for VS Code v44 is released on October 13, 2018, replacing the beta version that was released in Summer ’18. This would only be available if you Visual studio code as IDE. Apex Debugger, our interactive debugger, debugs only sandboxes and scratch orgs. But you can use Apex Replay Debugger in any org that you have the source code and a debug log for, including your production org. Apex Replay Debugger is not only free, but it’s also open source! For developers, this would be a great tool to debug easily than parsing debug logs. Please click here for more instructions on setting up this debugger. Receive near-real-time changes of Salesforce records, and synchronize corresponding records in an external data store. Change Data Capture publishes change events, which represent changes to Salesforce records. Changes include creating a record, updating a record, deleting a record, and undeleting a record. This is a beta feature available only to selected users who participate in a pilot program. This can be used to sync your SIS systems real-time based on changes to application, contact and affiliation records. To summarize, I would recommend the following 3 features which you should leverage right away. Watch out for the field history tracking limitation which would bite you when you want a report on fields beyond a year. Take backups of your database. As always feel free to post your questions and comments below or email me at buyan@eigenx.com for further questions. How to use Non profit starter pack for universities and how to prevent problems with it. Spring 15 features for higher education universities.